Bolobedu girl build a one bedroom house for her 2 kids after a cement truck collapsed. Pictures:Bolobedu women build a one bedroom house for her two kids after a cement truck collapsed. A women from Mamphakhathi village in Limpopo Bolobodu (Tzaneen) area managed to move out of a shack to a one bedroom house with her two children from different fathers since she is a single parent. 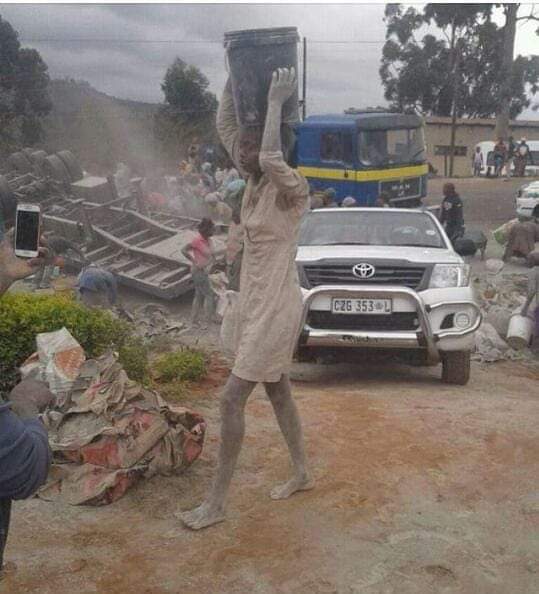 When a cement truck lost control and collapsed, it was a breakthrough for other people like this lady who happened to build a one bedroom house from cement collected from an incident scene. A source close to the anonymous girl told Mzansi Stories that the girl is struggling to survive and she is only depending on social Grant's money she receive monthly for her two kids. According to the source the girl has been struggling to save money from social grant she receive to buy Clements to build a house since she was staying in a shack.